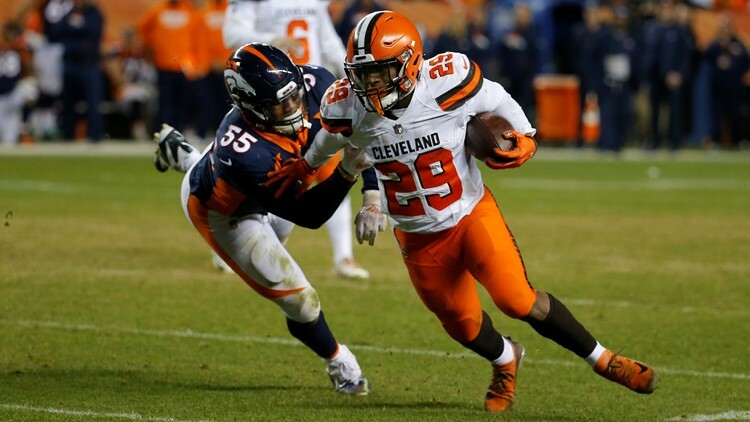 Cleveland Browns running back Duke Johnson (29) breaks a tackle and runs down the field during the first half of a prime-time game against the Denver Broncos at Denver Broncos Stadium at Mile High in Denver on Saturday, December 5, 2018. Report: Eagles remain interested in acquiring Browns RB Duke Johnson Jr. 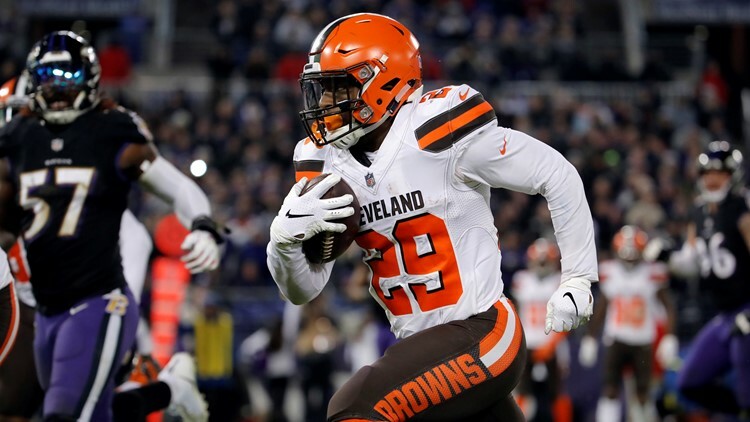 Reportedly, the Philadelphia Eagles remain interested in acquiring Cleveland Browns running back Duke Johnson Jr.
CLEVELAND — Could Duke Johnson Jr. be on his way out with the Cleveland Browns? That has been the question asked to the Browns multiple times since they signed free-agent running back Kareem Hunt on February 11, but to this point, and with an eight-game suspension looming for their newest ball carrier, the front office has not dealt Johnson Jr….yet. However, that does not mean the interest has waned in the veteran running back, as the Philadelphia Eagles reportedly are working on acquiring Johnson Jr. despite recently trading for two-time 1,000-yard rusher Jordan Howard from the Chicago Bears earlier this offseason. Cleveland Browns running back Duke Johnson (29) looks for a running lane during the first half of a prime-time game against the Denver Broncos at Denver Broncos Stadium at Mile High in Denver on Saturday, December 15, 2018. While “nothing has gotten close,” the interest is there in the Browns’ running back. Johnson Jr. did not report to Berea with his teammates for the start of voluntary workouts on Monday. With Hunt and near 1,000-yard rusher Nick Chubb in the fold with Johnson Jr., the Browns have a crowded backfield, but that has not yet been diminished by a trade. 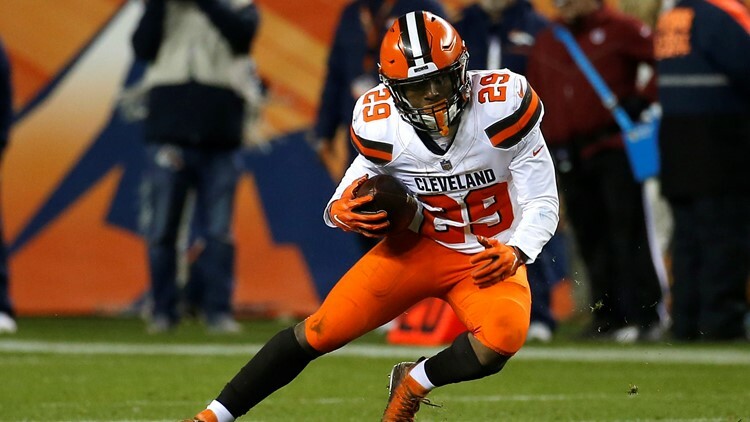 “I think Duke Johnson is a fine football player,” Browns GM John Dorsey said in a press conference at team headquarters following Hunt’s signing. After leading the Browns with 74 catches during the 2017 season, Johnson Jr. caught just 47 passes and got 40 carries. Despite the lightened workload, Johnson Jr. averaged a career-high 5.0 yards per carry and matched a single-season personal best with three touchdown receptions. Selected in the third round of the 2015 NFL Draft after a record-setting career with the University of Miami Hurricanes, Johnson Jr. has rushed for 1,286 yards and five touchdowns with 71 first downs and five 20-yard bursts on 299 carries over 64 games in four years with the Browns. Johnson Jr. has turned 235 catches into 2,170 yards, eight touchdowns, 29 20-yard plays, two 40-yard efforts and 103 first downs.